The Center for Management & Professional Development (CMPD) at the University of Dubai (UD), a prestigious university in the UAE established by Dubai Chamber of Commerce and Industry, has concluded the “Entrepreneurship and Business Plan Development” workshop for 19 women entrepreneurs who successfully trained on business management skills. A ceremony felicitating the participants was held recently at the Dubai Chamber with three of the participants receiving awards for the best business plans. The three-month training is part of Joint Venture for Finance & Entrepreneurship (JVFE), which was established in January 2005 as a joint venture between UD and the Citi Foundation. 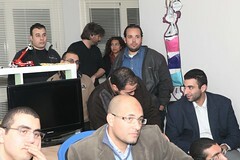 The JVFE aims at addressing the entrepreneurial qualifications of women through specialized and focused workshops.